Think hot dog and you probably think Germany, Austria and the USA. These countries brought the sausage-in-a-bun craze to the world and ever since have been perfecting it. Canada however, is emerging as a dog tour-de-force. Vancouver’s Japadog chain garners lines down the street, whether it be rain or snow. And Toronto’s Yonge Street is home to many a doggie vendor. 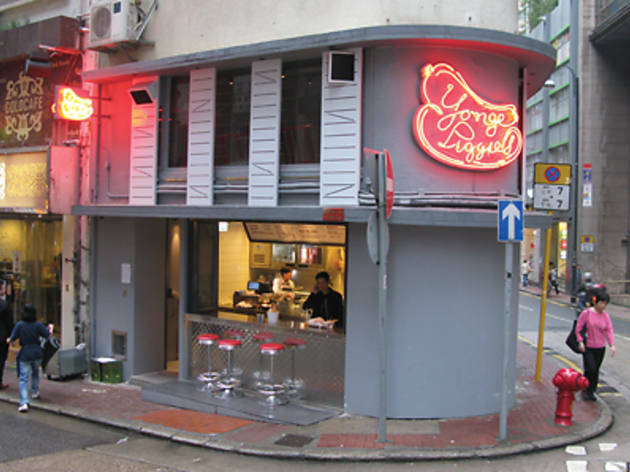 And it’s Yonge Street which takes credit for the inspiration behind the new Canadian hot dog joint in Sheung Wan. Yonge Piggies – all neon-signed and retro diner-decorated – offers an extensive menu of North American favourites including poutines, chilli bowls, draft beers and milkshakes. But, of course, it’s all about the dog. There are three sausages imported straight from Canada to pick from – sweet honey garlic, spicy picante pepper and woodsy hickory smoke ($65 each) – and you can select from an abundance of toppings to pair your wieners with. The sausages, especially the picante pepper, are robust and oozing with meat – each bite providing a satisfying snap. Beware: though it’s fab to see unusual choices like beets and sweetcorn on the list, too much piled on the franks can drown out the sausage’s intended flavours. We pair our dogs with a poutine and a milkshake – and both prove they’re good companions. The poutine’s ($28) gushy gravy and soft cheese curds leave the otherwise perfectly crispy fries scrumptiously soggy. The earl gray milkshake ($36) is also a fabulous cold brew with a creamy texture that’s not too sweet – great for the Asian palate. 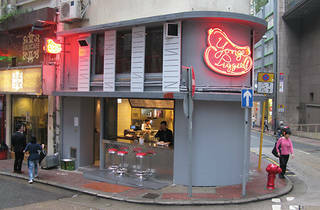 G/F, 1 Jervois St, Sheung Wan, 2104 7218; yongepiggies.com. Mon-Wed 11am-10pm, Thur-Sat 11am-late. Dinner for two: Around $200.